Getting Clean while Going Green! When preparing your home to be sold, one of the easiest things you can do to make sure it’s in top-notch showing condition is to…clean it! Simple, yes. But full of impact. 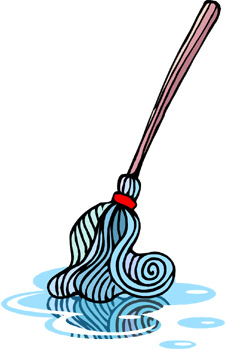 A clean home can make a big difference to potential buyers. It shows that you are motivated enough to use a little, good ol’ fashioned elbow grease and that you care about the home you’ve been living in. You’ll want to clean everything from the windows to ceiling fans and everything in between. With all of this going on, typical cleaners can let a lot of harmful toxins into the air and cause pollution. Consider using green products for this chore or even homemade products. Traditional products are typically petroleum-based and have negative effects on both your health and the environment. These products also contain harmful chemicals that you don’t actually need to clean your home. Watch out for anything with corrosives, chlorine bleach, ammonia or phosphates. These chemicals cause skin irritations, burns, inflammation and vomiting, and they release toxins into the atmosphere. Doesn’t really sound like something you want in your home, does it? Especially when you need your whole house to be spick-and-span for a showing. Alternatively, green products are non-toxic and biodegradable, and they are just as effective at getting your home clean enough to show off to potential buyers! The best way to get a totally green product is to buy one that lists all of the ingredients and specific information. Quality green cleaning products include Soap Works products, Earth Rite products, Clorox Green Works products and Weiman products, just to name a few. To take it a step further, use natural fiber sponges and rags instead of paper towels to reduce paper waste. You can also make your own cleaning products with these simple recipes that are completely green and work great! The basic ingredients of most home recipes are white vinegar, baking soda and borax. Countertop and Cabinet Cleaner: Mix warm water with dish soap and baking soda. Dip cloth in mix and rub on surfaces. Glass Cleaner: Mix one cup each of rubbing alcohol, water and vinegar in a spray bottle. Carpet Freshener/Rug Cleaner: Sprinkle on borax or baking soda over the area and vacuum or repeatedly blot the stain with a mixture of vinegar and soapy water. Furniture Polish: Mix one cup of olive oil with half a cup of lemon juice in a spray bottle. Use a rag to clean. Toilet Bowl Cleaner: Make a solution of half a cup of borax with a gallon of water and use to scrub, or you can put a fourth of a cup of borax in the toilet bowl and let it sit overnight. Scrub it the next day. All-Purpose Cleaner: Mix one quart warm water, one teaspoon liquid soap, one teaspoon borax and a quarter cup white vinegar in a spray bottle. Use it on counters, floors, walls, carpets, upholstery or wherever else you need in it your home. It is all-purpose after all! Remember, when using your new green products, test each mix on a small part of what’s being cleaned to make sure the cleaner is compatible with the surface. Also, clean from top to bottom since loose dirt tends to fall from ceilings and walls to lower surfaces like the floor. Now get out to the store to pick up your eco-friendly products or start mixing up your own. By using the green-cleaning method, you’ll get your home green clean!